Children, some of you are moving way too fast and have way too much on your plate. I have not given you any of the things you have overburdened yourselves with. My yoke is easy and my burden is light. It is time for you to cut off some of the things you have overburdened yourselves with, most of which are material, carnal, fleshly. Children, I need all of you dedicated to a constant prayer life. The days ahead are frightfully dark and indeed men’s hearts will fail them when they see the things that will befall the earth, only prayer and fasting will be able to sustain you for I will remember you in the middle of the overthrow. I will not forget your faithfulness and I will be merciful to your seed. Children, this is not the time to dip and dub in the things of the flesh, no, it is time to stand resolute in the Spirit for righteousness sake. I tell you truthfully many of my children will be caught totally off guard by what is about to befall them, they have been taught for so long that they will escape the hour of trial that is coming upon the earth and they have believed it to mean that they will not experience any trials or tribulations, yet my word clearly says in Matthew 24:21 that there will be great tribulation such as was not seen since the foundation of the world till then. Read Matthew chapter 24 and 25 then ask me for revelation. Children you will go through trials and tribulations, do not be deceived, the church will not be left unscathed for judgment will begin in my house before my return for my bride, for if I was to return now in the state in which the church is right now too many of my children will be left behind. 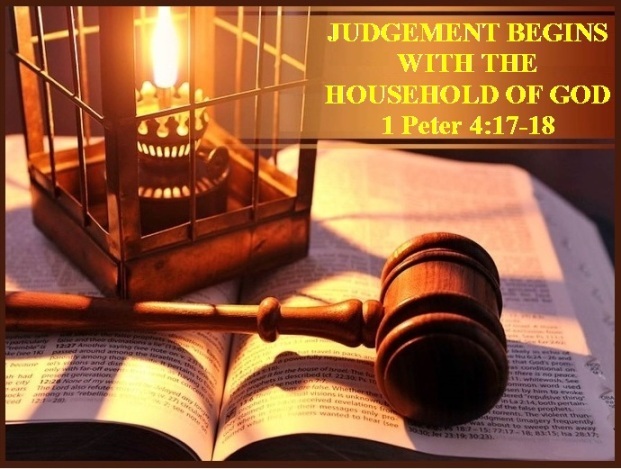 My judgment on my church is my mercy and grace upon my children for my judgments are meant to awaken you to your condition, to call you to repentance and urge you to be ready for my return. My judgment upon my church will be my final call to my church before I return for my bride, those who heed my voice will be rescued but those who remain obstinate will perish. Children, once again I say, judgment is coming to my house, examine yourself, repent now and turn from your wicked ways, judge yourself do not wait for me to judge you. My word is a lamp unto your feet and a light unto your path, it clearly tells you the difference between right and wrong, my Holy Spirit brings conviction to your heart. Listen to all the warnings I am sending to you act on them and repent now; you do not have much time, the end of this age is at hand. Will you be as the foolish virgins and be found unprepared? Will your sin find you out on that day? Will you be found wanting on the scales of judgment? This is the time to decide your ultimate destiny; the decision is in your hand and in your mouth. Listen to the words of warning from my watchmen, they can clearly see the coming danger, listen and take heed, prepare yourselves for the future of this world is bleak and without me you will dwell in perpetual darkness.